On the left, The Sower painted by Jean-Francois Millet in 1850. On the right, our township Natural Areas Stewardship Manager, Dr. Ben VanderWeide on April 13, 2018! Sometimes, ancient ways of doing things make the most sense in stewardship work. 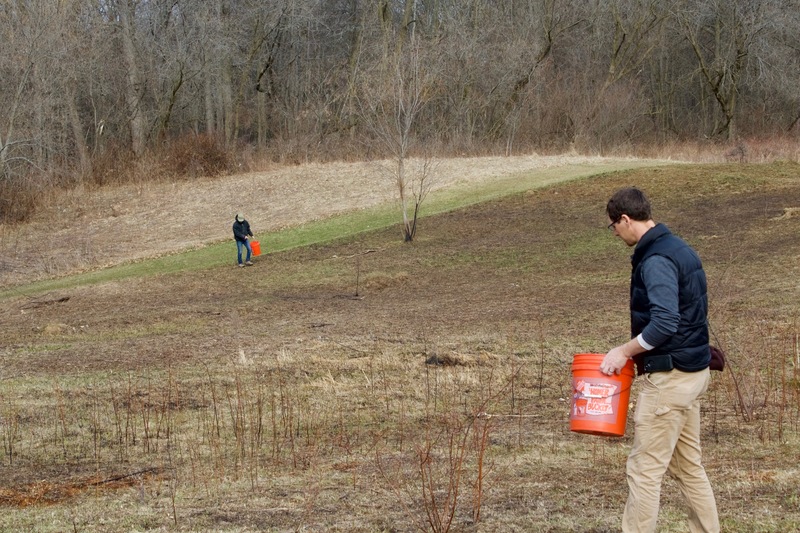 Every autumn, Dr. Ben, Alex Kreibel (the stewardship technician), and volunteers gather native grass and wildflower seed from parks around the township. So what a pleasure on a crisp spring morning to hand sow those seeds! The prescribed fire crew burned the fields at Bear Creek Park back in late March (see photos at this link) to encourage native plants and discourage invasive species. Already the blackened soil is turning brown and green. It was a good time to hand sow native seed – grasses like Big Bluestem (Andropogon gerardii), Little Bluestem (Schizachyrium scoparium) and Indian Grass (Sorghastrum nutans), plus wildflowers like Woodland Sunflower (Helianthus divaricatus) and Showy Goldenrod (Solidago speciosa). By adding native species, we hope to increase plant diversity and improve habitat for pollinators, birds, and other wildlife. So the three of us (Ben, Alex and I) relived an ancient and deeply satisfying spring ritual – the sowing of seed.